A rustic themed event is always warm and welcoming. Add double hearts and you will have a special day to remember! This bottle stopper is made from solid metal and has a stunning antique copper finish. It features a double heart on the top. The heart top is attached to a metal stopper bottom that is finished in a matching antique copper. The stopper has a black rubber gasket in the middle for a tight seal. The stopper is presented with a burlap bag with a jute string closure. The perfect love themed favor for rustic themed events and weddings. Size 4 3/8 inches x1 1/2 inches. 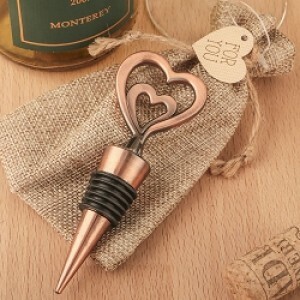 Double heart bottle stopper in antique copper finish. Made from solid metal. Antique copper finish. Double heart at the top. Attached to a metal stopper bottom finished in a matching antique copper. Stopper has a black rubber gasket in the middle for a tight seal. Rustic individual burlap bag included for each bottle stopper. Burlap bag has a jute string closure and a heart shaped 'For You' tag in brown and sepia tones. Great love themed favor for rustic themed events and weddings.